Death is never easy. If it devastates adults, just think of the effect it can have on young children. The mere concept of death conjures dark, hazy images and feelings of fear and dread. 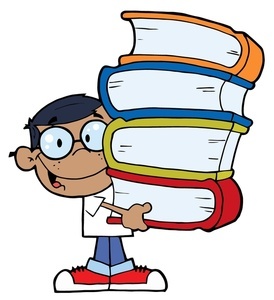 In short, it is a subject most people avoid at all costs. But what if death is not so bad at all? What if Death is simply misunderstood? What if Death is just as sweet as Life (who happens to be her sister). What if Death is a quiet and lonely little girl who rides her bicycle along the path of life, and what if her relentless travels take her all over; from circuses with humongous animals, to forests, to individual homes, to big cities, to isolated farms? 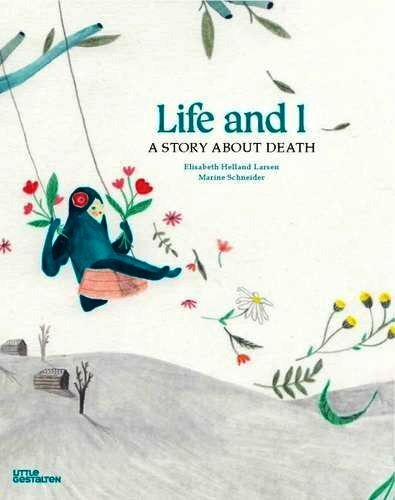 This concept is the theme of a quiet new picture book called Life and I: A Story About Death, by author Elisabeth Helland Larsen. 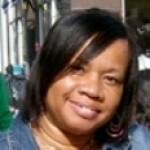 As Death travels, she explains herself. She divulges that she “may arrive before the birds awaken or after the sun has swept over the sky,” and that some who meet her “light candles as they see me approach. Others close the curtains and hope I might pass by.” In her quiet, almost unassuming way, Death goes on to explain that she “comes most often to those with wrinkles…who have lived life the longest.” But Death does not neglect to explain that she also sometimes visits those still living in tummies (the unborn). If it is possible for a book to be both lovely and haunting, this is the one. The prose is quiet, matter-of-fact, and wistful enough to bring a hush to the reader’s inner soul. But it is also comforting and reassuring as it explains the process of death and how those who take that lonely walk are never alone because Death is right there with them. Perhaps the most hopeful part of the book is when Death explains that “Life and I live together in every body.” Readers understand through the illustrations that Death and Life are sisters who watch over the earth (and the people in it) with love, compassion and dedication. 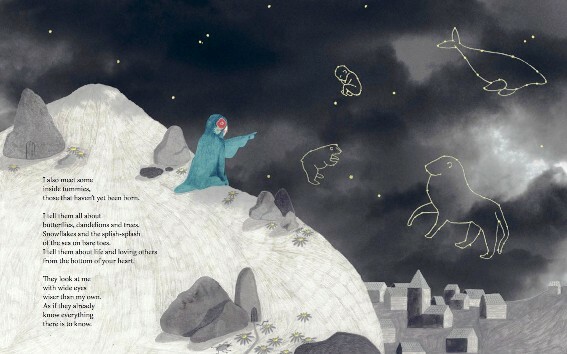 Illustrator Marine Schneider’s skill and sensitivity shine in this book. She paints flowery forests, exotic animals, tiny forest creatures and even shimmering stars in pale pastels, and then sets them against a backdrop of faded white and gray backgrounds to keep the subject of death ever at the forefront. It must be mentioned that this book isn’t for everyone. It targets ages 5 to 8 (grades K-3)–an age group that may be haunted by the suggestion that death is always lurking somewhere in the shadows. It’s true that it is, but the concept may still be frightening. That being said, death is an inevitable part of life, and early dissection of what happens when it occurs may be the key to learning to accept and even embrace the concept. 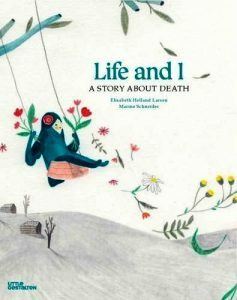 Therefore, when the time comes that death must be discussed with your little one, introducing this lovely book is probably the very best way to begin.